The Kasumi Japanese Chefs Knife is a high-quality chefs knife made with traditional Japanese sword making techniques that have been handed down over hundreds of years. This is a well designed and well-crafted blade, with an eye-catching Damascus pattern reminiscent of the classic Samurai sword. The laminated Pakkawood handle is secured by three stainless steel rivets. The lamination helps maintain a good grip, and it’s also a material that will hold up to heavy duty commercial kitchen use. Between the handle and blade is a bolster that provides the right amount of balance and comfort. The Kasumi Japanese Chefs Knife is made in Seki, Japan. The tradition of making Damascus pattern knives originated in this same city, way back in the 13th century. The Kasumi Japanese Chef’s Knife honours this legacy by producing knives suitable to those same standards created so long ago. If you have ever wondered how they forge the knives, take a look at the Kasumi process in the video below. The Kasumi Japanese Chefs Knife sticks out for how well it maintains it’s sharpness. This knife is also forged with cobalt, manganese, molybdenum and vanadium for easier sharpening and increased durability. This is a blade that is great for at home cooking but can still handle a full day’s work in a commercial kitchen. It’s also safe to say this blade looks as good as it performs. The 33 layers of stainless steel create a unique Damascus pattern, and the Pakkawood handle fits well with an added bolster for balance. The two rivets are a nice deviation from the usual three seen in most handles. This is a chef knife with restaurant appeal as well. The handle is perfect for a commercial chef – it’s comfortable in hand, and the laminated Pakkawood provides an excellent grip under any condition. Plus, it’s balanced enough to minimize the strain on your wrist. The blade itself is suited for a commercial kitchen too, as it maintains its sharpness well even with heavy use. The only real downside of the Kasumi Japanese Chefs Knife is the price tag. It is the second priciest in our review guide. 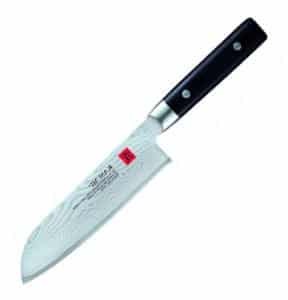 However, you will be hard pressed to find a Japanese chefs knife of this quality for less. The Kasumi Japanese Chefs Knife is a traditionally made knife, crafted in the city where Damascus knives were first made in the 13th century. The high quality, new age steel compliments the traditional Damascus forging methods and creates a blade that will looks great and will perform for many years. Kasumi Japanese Chefs Knife – While we ranked the Kasumi number one on our best japanese chef knives list, it’s not even the most expensive. Truth be told, the cost difference between this knife and others on the list is not very much. When you consider the high level of craftsmanship and the reliability of the Kasumi name, you can’t go wrong with this japanese chefs knife.